1996 Lagun “Lagunmatic 3516S” CNC Vertical Machining Center s/n 6320 w/ Lagunmatic LG1000-32GX / Dynapath Delta CNC Controls, 18-Station ATC, CAT-40 Taper Spindle, Hand Wheel, 15 ¾” x 35 ½” Table. 1995 Lagun “Lagunmatic 717” CNC Vertical Mill s/n 35246 w/ Lagunmatic 1000GX / Dynapath Delta CNC Controls, 40-Taper Spindle, Travels X=32”, Y=17”, Z=7”, Power Knee, Hand Wheel, 11” x 51” Table. Motor, 60-4200 Dial Change RPM, Chrome Box Ways, Power Feed, R8 Spindle, 11” x 58” Table. JFMT – Amura mdl. J1-400 II 16” x 40” Geared Head Gap Bed Lathe s/n 171 w/ Newall C80 DRO, 38- 1575 RPM, Inch/Metric Threading, Tailstock, Steady and Follow Rests, KDK Tool Post, 5C Collet Closer, 8” 3-Jaw Chuck, 12” 4-Jaw Chuck. Samson mdl. 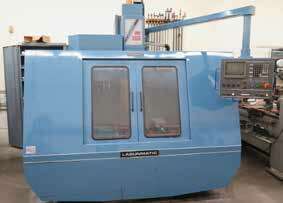 LAM-350B 10” x 24” Lathe s/n 705555 w/ 3-Speeds, inch Threading, Tailstock, Steady Rest, 5C Collet Closer. Hardinge mdl. HC Hand Chucker s/n HC-7049-T w/ 125 -3000 RPM, 8-Station Turret, Power Feeds, 5C Collet Closer, Coolant. Max Universal 16” Pedestal Disc Sander w/ Dust Collector. Powerex mdl. CT5308V1 5 Hp Vertical Air Compressor s/n 050990L-987777. Busch Type 016118 Vacuum Compressor s/n 21722 w/ 8 CFM, 30 Gallon Tank. Custom 56” and 40” Induction Band Plastics Bending Heater. Wadkin Bursgreen mdl. 10”AGS 10” Tilting Arbor Table Saw s/n 10”AGS83710 w/ 52” Table Extension, Fence System. Master Machine mdl. MC-10SPS Oscillating Spindle Shaper s/n 005923 w/ 3/8” to 4” Spindles. Wadkin Spindle Router s/n UR/B83131. Cyclone Style Dust Collection System. Early 1900’s Austrian Oak Hall Tree w/ Seat. Herring-Hall-Marvin Safe Co. “Railway Express Agency” Safe. 1929 Toledo Style 1821CS 500 Lb Platform Scale s/n 457981.